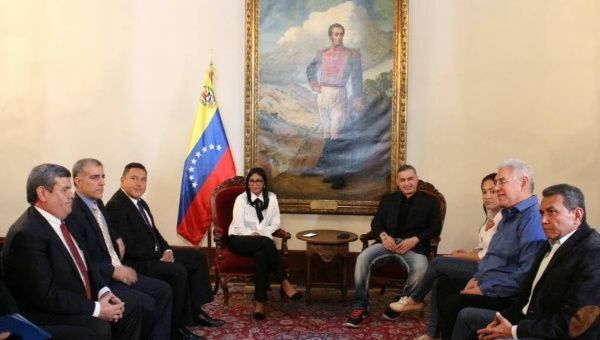 Attorney General Tarek William Saab and President of the Venezuelan Constituent Assembly, Delcy Rodrígue (center) meet with representatives of the various opposition groups Friday. June 1 (teleSUR) The Venezuelan government has begun releasing a number of opposition activists and politicians, who were facing trial due to their participation in or incitement of a series of violent acts that left nearly 200 people dead between 2014 and 2017. The move comes after Venezuelan President Nicolas Maduro met with four opposition governors Thursday and was announced the country’s communication minister, Jorge Rodríguez. The measure is part of Maduro’s post-electoral promise to advance dialogue and peacebuilding measure between the Government and opposing groups. Attorney General Tarek William Saab, who is charged with overseeing the Venezuelan Truth Commission the organization tasked with reviewing the list of persons released, meet with representatives of the various opposition groups Friday. Saab said he understood the decision would produce mixed emotions given that some of those released were responsible for the deaths of other citizens; however, he said the move is meant to put the country on a path to peace. A total of 39 Venezuelans who were processed and sentenced for crimes under Venezuelan law have received judicial benefits according to a public statement released by the Supreme Court. The benefits include pardons and alternative forms ways to fulfill their sentences such as release with prohibitions to leave the country or house arrests. Among those who benefited is Daniel Ceballos, the former mayor of San Cristobal. He was elected in 2013 and imprisoned in 2014 after refusing to carry out an order by Venezuela’s Supreme Court to guarantee peace and public order in the face of violent protests. In 2015 he was granted house arrest but was later returned to prison after the interior ministry uncovered escape plans. Ceballos is also accused of leading a riot in Caracas detention center known as Helicoide. Ceballos will be released but will have to report to the police every 30 days, and will not be able to leave the country or give declarations through social media. Others released include: María Elena Uzcátegui, Carmen Alicia Gutiérrez Acevedo, Carmen Briones Donoso, Angelis Quiroz Gutiérrez, Ninoska Josefina Bolívar, Stefanny Salazar, Diannet Milagros Blanco, Brigitte Herrada, María Angelina Salcedo Torres, Nazareth Vásquez, Virgen Liliana Quintanillo, Erika Palacios Alfonzo, Melanye Álvarez Castro, Geraldin Chacón, Marianyelis Sánchez Delgado, Gregory Hinds Rodríguez, Juan Pablo Giraldo, Juan Pedro Lares, Fermín Cocchioni, Diego Gómez, Ender González, Dylan Canache. Rodriguez said the measures were supported by the families of the victims of the violent “Guarimbas,” and announced more people would be released in time. “When President Nicolas Maduro requested these measures, as widely as possible, for people who were deprived of their liberty for political reasons, in that case you in the first group are benefiting from this measure. In the upcoming hours, the country will know the following groups who are subject to this measure but, because of processing, (their release) could not happen the same day,” she said.